Please visit www.aegstl.org for more information. The April Chapter Meeting will be held on Wednesday, April 24 at 5:30 PM at CJ Muggs (101 W Lockwood, Webster Groves, MO 63119). Enter the meeting room through the lower entrance (see attached map), or enter through the main entrance and descend the stairs to the meeting room. Dr. John Encarnacion of St. Louis University will present on “Paleotectonics of Southeast Asia: Some Lessons Learned.” Cost will be $30 for members, $40 for non-members, and $10 for students and those between jobs. Please RSVP at http://www.aegstl.org/monthly-section-meetings/ by Tuesday, April 25, 2019. Saturday, April 6, 2019 - AEG Student Workshop at Geotechnology - Advance registration is required. See below and attached for additional information. Friday, April 12-Sunday, April 14 - Earthquake Insight Field Trip - Field trip throughout the New Madrid region. See below for additional information. Wednesday, April 24, 2019 - AEG St. Louis Chapter Meeting - Dr. John Encarnacion of St. Louis University will present on subduction zones. Location: CJ Muggs (101 W Lockwood, Webster Groves, MO 63119). Friday, May 31, 2019 - Tour of Alberici Campus - Private tour of the Alberici Corporate Headquarters building, which is an adaptive reuse of an existing manufacturing plant. See below for additional information. Geotechnology will host the Biennial Subsurface Exploration Student Workshop at their office on Saturday, April 6, 2019. The workshop will be from 9:30am to 4:00pm. Advance online registration is required. The cost is $10 per student (collected at the event, rather than through the online registration.) See the attached announcement for additional information. Students - if you registered for the event in the fall, you will need to re-register for the spring event so that we can have an accurate headcount. If you would like to help with the event, contact Jessie Goodwin (jgoodwin@geotechnology.com). Save the date: The 2019 Earthquake Insight Field Trip will be held on Friday afternoon, April 12, through midday Sunday, April 14, 2019. CEUs and PDHs available. Details next month. Phyllis Steckel will lead the trip. Benefits of being a Meeting Sponsor include: a 20-30 word summary in the newsletter, one or two PowerPoint slides to run on the slide-show loop that is projected in the dining room during the networking and dinner time, and if a representative of the sponsoring company attends the meeting, he or she will have two to three minutes to talk about their organization. Brochures, giveaways, table-top displays, and business cards are certainly welcome as well. The St. Louis Chapter of AEG is looking for short (20-minute) presentations for a future meeting. Do you have a case study that would make an interesting short presentation? We would like to hear from you. Contact Stephanie Kline-Tissi (klinestephaniej@gmail.com) if you have a short presentation. 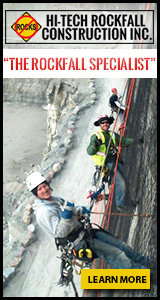 The St. Louis Chapter strives to continually educate and connect professionals, students, and the public in a unique region that encompasses karst, alluvial, glacial, and seismically actives areas as well as active and historical mining. In many places these topics overlap and interact with each other creating unique and varied engineering and environmental situations. The St. Louis Chapter works with educators and students in Missouri and Illinois. If you are interested in having a professional speak in the classroom (any age group) or know of a student interested in job shadowing, please do not hesitate to contact any of the officers. Currently, we have one Student Chapter in our Section at Missouri University of Science & Technology (Formerly University of Missouri-Rolla). For more information on the Chapter, please visit their page. (Click link below to webpage) We encourage students at other universities within the St. Louis Chapter to start your own Student Chapter. Our officers would be pleased to meet with you and your fellow students to get you started! For more information about the Missouri Univ. of Science & Technology Student Chapter go to the Student Chapter web page. These companies have supported the efforts of the St. Louis Chapter of AEG this past year. Please thank them for their support. Send pictures to Anna Saindon (rmsain@gmail.com) and feel free to include descriptions and stories.